Does Anyone Else Try To Match Specific Inks To Specific Papers? Some of you like to match specific inks to specific pens. And I do that myself, sometimes. But do any of you try to match specific inks to specific papers? 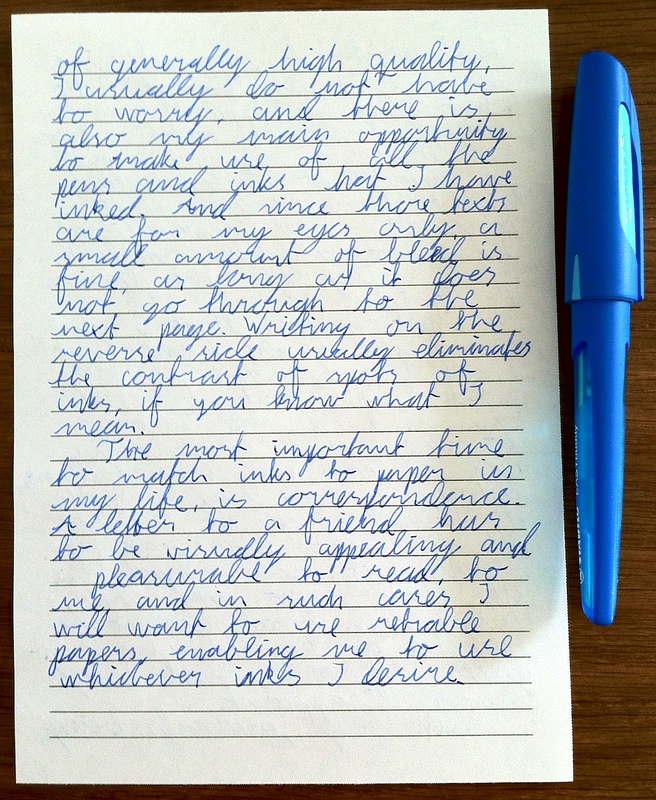 I really love Kaweco Paradise Blue but recently discovered that the strokes of ink form a weird greasy-looking halo, plus bleed-through, apparently only on cream-colored Rhodia paper after several months. I checked back in my Leuchtturm 1917 notebook where I had used the ink about a year or two ago with no such problems showing up (just a tiny bit of bleed-through). And some inks look dulled on off-white paper, while others look richer. Right now I am trying to find a good A5 notebook match for J. Herbin Cacao Du Brésil, my all time favorite ink. I was using it in my Bullet Journals but the color visually made the dot grid on my journal pages look extremely prominent, causing each page to look like a crazy Svengali hypnotic pattern (i.e. hard to read)! I’ve been trying lighter dot-grids than what is in the Rhodia “goalbook,” but I may have to move to a lined or blank journal if I want to use my favorite ink. What inks and papers do you like to use together? I'll admit that I use all sorts of inks on all sorts of paper. If I'm making lists, I'm often doing it on scrap paper, which is printer paper where the front side is no longer needed (stuff like scavenger hunts I've run). My morning pages journals for the last couple of years have been the Miquelrius 300 page jobs -- and then it's whatever pen I feel like using on any given day. When I was working on a research project last year, a lot of my notes were on one of the large (legal size) Rhodia pads (the slightly bigger than 11 x 14 size ones, and then when I used up the pad (only writing on one side) I switched over to a blank pages on from Paper for Fountain Pens that had Tomoe River paper. The only time I really try to match paper to ink is when I'm trying to do calligraphy, in which case I'm often using Tomoe River. But I don't really pay a lot of attention to what color inks look better or worse on, say, yellow vs. cream vs. white. I almost exclusively write on off-white or cream papers, but I do have some whatever papers for some of my brighter inks when I have something joyous to share via snail mail. I prefer bright, white paper so the the color of the ink stands out. The only real matching I do is using inks that preform well on the copy paper at work - minimal show/bleed, fast dry, etc - whatever color it is. I'll admit that I use all sorts of inks on all sorts of paper. If I'm making lists, I'm often doing it on scrap paper, which is printer paper where the front side is no longer needed (stuff like scavenger hunts I've run)....Paper for Fountain Pens that had Tomoe River paper. Tomoe paper is really lovely, isn’t it? I started using fountain pens relatively recently and only for writing in my journals or drawing or sketching. I intended to confine my fountain pen use to just those purposes, but have found that I seldom like to write with much else these days. So now I use fountain pens on any old paper and whenever as well. But I am still picky about what paper I use in my journals, even more than what I use for my sketchbooks. You keep morning pages...are you an artist or writer? I enjoyed reading about your different uses for ink and paper. I used to write letters all the time when I was a kid and youth. I still have some of the ones I received back from as early as when I was eight years old! Then email and busy work schedules came along. Do you write to friends and relatives or belong to a snail mail exchange? Which bright white paper do you like best? I had a couple of pen pals via the forum here, and a couple of other friends that I write to. More often than not though, it's letters written in my role as the Lorekeeper of my Kindred. All I use nowadays is pilot blue black on Rhoda/clairefontaine paper. Tried lots of paper and ink in past and this is what works for me. I don't know that I try to match the ink to the paper ... But I've certainly ended up using specific paper for inks. I mentioned in another thread just now that I ended up with a Diamine ink (boring old Violet) that I didn't care for when I took a stationer's advice for a replacement instead of asking to test it. The truth is, I only hate it on white, non-absorbent paper. On my journal, with a slightly absorbent 120gsm cream paper, it comes out such a rich, satisfying colour with sacks of character. (Despite my protestations of hate, this ink is staying with me because of the journal.) Similarly, Diamine Havasu Turquoise pops pleasingly on Rhodia with a fine nib. So I don't set out to match ink with paper, but there's some ink that only ever ends up on one type of paper. I wouldn't say I match paper to ink, I did invest in decent paper such as Clairefontaine, Rhodia, Tomoe River and some inks have a peculiar behaviour in some papers, e.g. Rohrer & Klingner Verdigris with a Pelikan m205 and a small bit of cellophane looks much darker in Tomoe River than on HP LJ 32 lbs, and Rouge Hematite with a Lamy Vista looks orange instead of red. My background is mostly as an artist -- I was an art major in college, and then worked for a few years doing commercial art at various places (traditional layout and pasteup) but my job skills are now obsolete. I did minor in Creative Writing though -- mostly poetry back then, but I'm now trying my hand at fiction as well. Doing the MP journal is what got me into fountain pens (although when I was a kid I thought they were kinda neat) -- in order to get myself into the habit of doing pages regularly, I decided to get myself a nice journal and a "nice" pen. I started out with a Parker Reflex, then after the rubber on the section disintegrated bought a replacement one; when the same thing happened to the second one, and I couldn't easily find a third, I upgraded to a Parker Vector, and when I accidentally left the pen and the then current journal at my brother-in-law's house (and didn't get it back for about a month) I found that writing entries with a ballpoint just wasn't the same experience somehow. In the process of finding a replacement until I got that pen and journal volume back, I went online and eventually found my way here -- and the rest is um, history... (I still have that Vector, and even though thebarrel has cracked at the threading I inked it up a couple of days ago, after stealing the converter from a different Vector; looks as if another Parker twist converter is on my shopping list for the next pen show I get to... ). As a college student, I constantly need to consider ink and paper combinations. 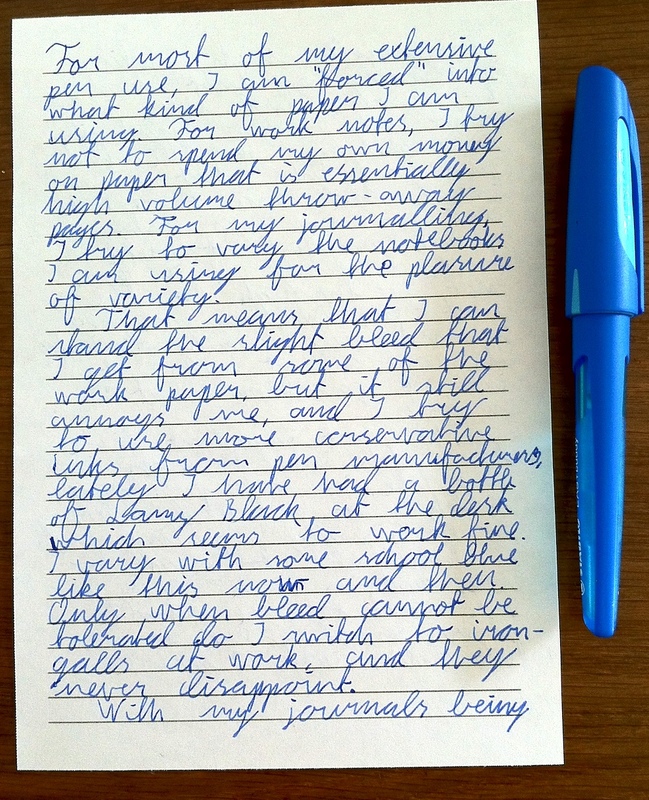 Let's face it: The handouts I get for assignments or tests or simply handouts that I need to take some notes on will NOT be on FP-friendly paper, so if I plan to use a FP despite that, I need it to an ink that can handle cheap nasty copy paper. And at the same time, I need color options. The right inks can handle a variety of paper types, from Clairefontaine to copier paper. But it also helps to use a fine nib, to expand my options. Yes, but I'm not OCD ... okay, I've never been diagnosed. But really... some inks perform better in some pens and some inks just look better and write better on some papers. Oh and that recycled paper calls out for the largest ball point possible. I am desperately poor, and notoriously cheap. Hence, I use what paper I can get cheaply. Most often this is the reverse of the Georgia Pacific "Basic" print/ copy paper at Walmart, which is 20lb letter sized copy paper with 88 brightness. We print it on one side, set it aside, and eventually I three-hole punch it and put it in ringbinders for use in class, where it gets my notes, and in my demented scribbling reflection journal. I also have some old Norcom/ Walmart narrow ruled 8x10.5 spiral bound 70 sheet notebooks, which are (unfortunately) college ruled and enhace feathering. I'm using one as a bullet journal right now. And I just dilute the inks that feather, as much as is required, and generally prefer fine nibs anyway. No, I do not match paper to ink or vice versa. The papers I use are cheap, some are pocket-change cheap. I tend to match papers to nibs. Some papers, despite the low cost, work very well with nibs - adequate balance of smoothness and feedback, not too hard, reasonable line width.